Wednesday, May 15, 2002... Greetings from Fargo, ND, where every road in town seems to be under heavy construction. Started the day with 100 miles of eastern Montana emptiness, then traversed two dozen miles of North Dakota emptiness before the scenery improved at Theodore Roosevelt National Park. The Park includes both the North Dakota badlands (with more vegetation than their South Dakota counterparts) and the site of the future President's Maltese Cross Ranch. Roosevelt was a bespectacled, asthmatic 25-year-old rich boy from Manhattan when he arrived in Medora, North Dakota, determined to run a cattle ranch amidst some of the nation's least hospitable terrain. The park's current inhabitants include hundreds of free-roaming wild horses, as well as prairie dogs and bison. One publicity-hungry bison lay down just inside a park entrance, on a traffic island near the park's Welcome sign, watching placidly as a herd of camera-wielding drivers circled slowly around him. I could have continued across the state on I-94, but 45 miles past the national park, a series of homemade signs beckoned me toward North Dakota's "Enchanted Highway." 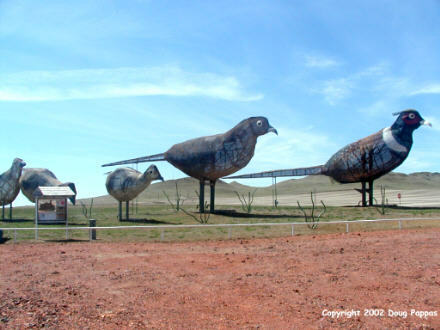 A couple of days ago I noted my distaste for the word "enchanted" in the context of a South Dakota doll museum, but when combined with the word "highway" it didn't seem quite so odious...particularly since i knew the story behind the Enchanted Highway. The Highway was the idea of a man from Regent, North Dakota. Regent barely registers on a map of southwestern North Dakota, its main contact with the outside world a 32-mile-long road that leads directly to the Interstate with no towns in between. Although the road is so unimportant, even by the standards of rural North Dakota, that it's not labeled a state or federal highway, the enthusiastic folks of Regent saw the road as an opportunity to attract tourists. 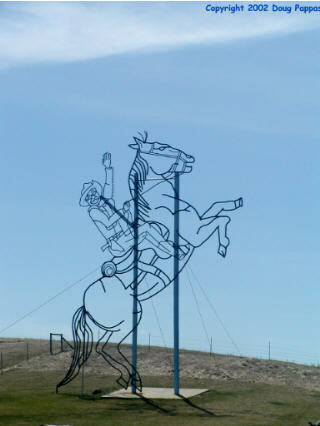 They hit upon the notion of an Enchanted Highway, with ten enormous metal sculptures overlooking the road every three or four miles between Regent and the Interstate. 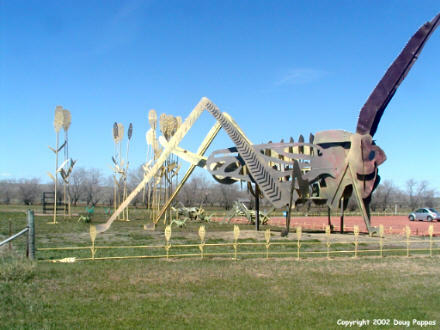 So far they've raised the money for four of the 10 sculptures: a giant grasshopper, a family of building-sized pheasants, a wire outline of Teddy Roosevelt on horseback, and the "World's Largest Tin Family," oversized images of a farm family's Mom, Dad and Junior. Having found Regent, North Dakota, I next had to decide how to get out. Fortunately US 12, which 80 years ago was known as the Yellowstone Trail, ran through the area -- and the small town of Hettinger, ND had the only original Yellowstone Trail marker known to exist. Shortly after this unusual photo opportunity, US 12 crosses into South Dakota near the town of Lemmon, which put itself on the map in the early 1930s by filling a town park with sculptures made from petrified wood. For good measure the locals built the information station, as well as the adjacent gas station, out of petrified wood. In Lemmon I also photographed South Dakota's most macabre roadside sight: diamond-shaped markers erected on the sites of fatal auto accidents, bearing a large red X in the middle, the word "Think!" on one side, the phrase "Why Die?" on the other. But as I headed out of town to the east, driving toward the road that would take me back to I-94, I suddenly felt like I was back on the Yellowstone Trail circa 1915. Road rebuilding had obliterated several miles of the road, forcing drivers to follow behind a pace car down a heavily rutted dirt path worn through the construction site. Once back to the Interstate, I stopped only for World's Largest Animals. First came Salem Sue, the World's Largest Concrete Holstein, on a hill overlooking New Salem, ND. A motel in Steele, ND displayed the World's Largest Concrete Whooping Crane. 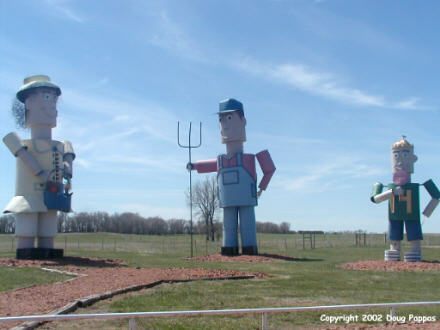 Jamestown, ND is proud of its three native sons: Anaheim Angels outfielder Darin Erstad, Western novelist Louis L'Amour, and the World's Largest Concrete Buffalo, erected on the edge of Jamestown's Pioneer Village. Here in Fargo, the local hero is Roger Maris, whose unassuming North Dakotan ways never quite meshed with the New York sportswriters. The Roger Maris Museum, which contains his MVP trophies and other memorabilia, consists of several display cases in a wall of a local shopping mall.